Martin Limbeck is a renowned international sales and management trainer. He stands for an efficient and targeted tuning of sales teams and processes. His skill lies in tapping into the average sales professional’s potential and making top sellers out of talented ones. This enhanced power provides companies with increased sales, better prices, and higher revenue. Martin Limbeck is not only a sales trainer. He is one of the best and most successful sales experts in Europe and the owner of the Martin Limbeck Training Group. Based on his best-in-class German Sales Engineering approach, world-renowned companies place their trust in his expertise in order to raise their sales organization to a new and even more successful level. Thousands of sales professionals have attended his seminars and sales training programs to learn to close deals on an equal footing and maximize their sales potential. 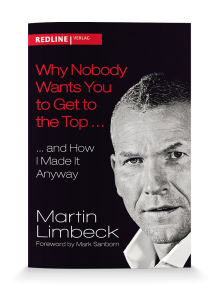 True to his motto of “drop the role of the victim, and embrace the winner’s mentality,” Martin Limbeck does not only teach sales techniques, he invests salespeople with a new stature, making them strong and confident equal partners in the eyes of their customers. Every sales training program is tailored specifically to you and your team, so that every executive and employee in the sales department can benefit from the best training for their respective challenges. We will be sure to find the best solution for your needs. Come talk to us.